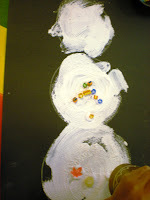 Today was the day to "bring our snowmen to life." 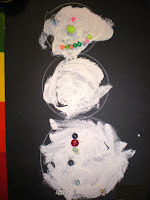 Our paint had dried and they were ready to go. I was able to find some different things in the craft closet. 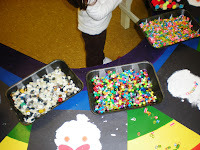 I put out beads, cut straws, pom poms, foam pieces, and buttons. (I was going to put out sequins but I forgot). Originally I thought about putting out wiggle eyes, but then I thought I wanted the children to be creative with the items that were out. 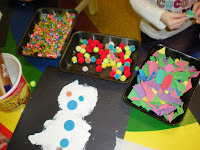 Today was also the first day we used glue other than glue sticks. 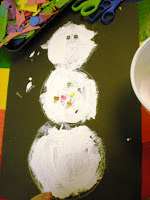 Because of the texture of the Ivory Snow paint we needed some glue with a little more strength. I put tacky out for them. It was really funny because some of them kept saying it was too hard, and others had glue from top to bottom. 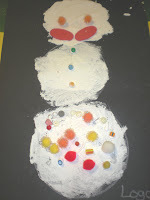 The snowmen really came out neat though. Some of the children even used the straw standing up to add more effect. 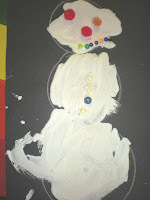 I thought they did a great job and the snowmen have such individual spirit. Mother Nature was very cooperative and we got a great dish of ice. If you recall, at Tuesday's class we put some water outside to see what would happen to it. 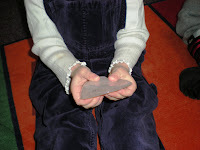 We brought the ice inside and got to feel how hard it was, how cold it was, and how it would melt in our hands. 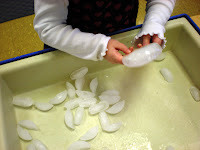 I then had some ice in the water table so they could play with it and watch it melt. Finally the book we read today is one of my all time favorites. I don't r eally know why I like it so much. It may sound corny, but it is just a sweet book. 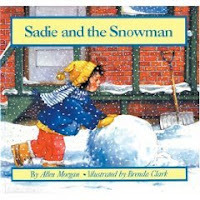 We read "Sadie and the Snowman," by Allen Morgan, illustrated by Brenda Clark. 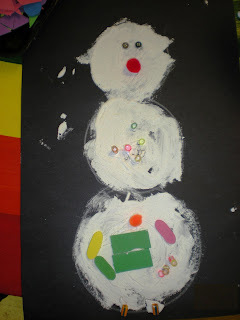 In this story a little girl named Sadie builds a snowman and gives him some food for eyes, nose, and mouth. He's a really good snowman and Sadie really enjoys him. Eventually, some animals eat all the food and he starts to melt. This continues for a while until the weather really starts to stay warm. 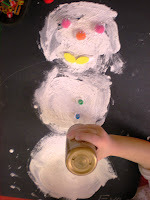 Will Sadie get to enjoy her snowman or will she have to say good-bye?